In October 2015, the University of Chicago celebrated its 125th anniversary. More than 35 events were organized during the fall quarter by nearly every department on campus to celebrate the rich intellectual history of the institution and evolution of its divisions, schools, and other units. 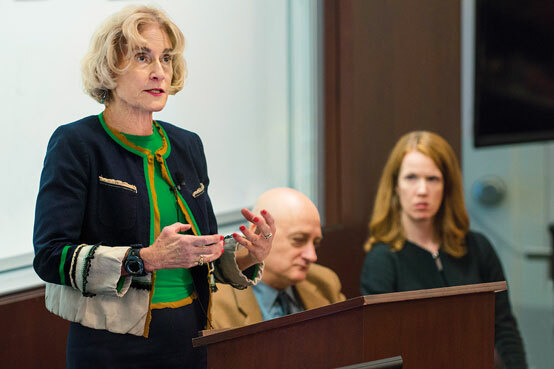 On October 2, 2015, Martha Nussbaum, Ernst Freund Distinguished Service Professor of Law and Ethics; Alison LaCroix, Robert Newton Reid Professor of Law; and Omri Ben-Shahar, Leo and Eileen Herzel Professor of Law and Kearney Director of the Coase-Sandor Institute for Law and Economics, spoke to a standing-room-only crowd on “The Law School’s Interdisciplinary Legacy.” The Record is pleased to publish the edited transcript of each professor’s remarks here. To read more about the University’s 125th anniversary celebration, visit 125.uchicago.edu. When University of Chicago President William Rainey Harper set out, in 1902, to incorporate law into our young university, he initially thought not of a law school, but of a research department of jurisprudence. He feared that a genuine professional school would be too intellectually thin to contribute to ongoing debates about the goals of our society and the nature of social justice. And indeed, as practiced at that time at Harvard and elsewhere, legal education was both thin and narrow. It had little to say about broader social questions. However, Harper’s leading advisor on law, Ernst Freund, then a professor in our Department of Political Science and the main architect of our law school, persuaded Harper that things could be otherwise. Unless . . . a university law school explores all the resources of law, learns from history, and inspires itself by university ideals, it does not do its full duty to the legal profession; but if, inspired by these ideals, it succeeds in broadening and deepening the law-consciousness of the legal profession, and indirectly thereby of the community, that will . . . be the most valuable contribution that a university can make to law and to legal science. Harper agreed, with the result that the first curricular proposal for the new law school, drafted by Freund, included a good deal of constitutional law and administrative law, along with criminology, experimental psychology, comparative politics, and the history of political ethics. Interestingly, both constitutional and international law were required in the first year. The Law School continued on its course, unswerving. Freund’s subsequent rise to national eminence with his work on the First Amendment, hailed by Learned Hand and ultimately even by Holmes, only deepened his influence. In 1932 at the age of almost seventy, in a convocation speech looking back at the history of the Law School, he judged that his ambitious interdisciplinary plan had been successfully achieved. The Freund plan, as we may call it, has only deepened and broadened from that time until the present day, gradually attracting imitators around the country. It explains why philosophers, psychologists, economists, political scientists, and other scholars from “outside” fields, or with dual degrees, now teach in law schools and why many law schools encourage law students to take courses outside the law school—though ours much more successfully than others because of our low quotient of bureaucracy and our uniform calendar. Now I need to say something about the particular role of philosophy, my own discipline. The role of philosophy in our law school, from the beginning, has not been limited to analytic jurisprudence, although that is important and is ably taught. Freund already favored a broader study of normative theories of political ethics and social justice. He saw human progress as depending on the broadening of a sense of justice and pushing the boundaries of justice into new areas, such as race and immigration. At his memorial service, social activist and thinker Jane Addams said: “He was probably the finest exponent in all Chicago of the conviction that as our sense of justice widens it must be applied to new areas of human relationships or it will become stifled and corrupt.” So our philosophy curriculum contains a marked emphasis on social and also global justice, including this year a law-philosophy workshop devoted to race, including a regular course on feminist philosophy, and including a variety of other courses touching on theories of justice and normative ethics. Some of this teaching is itself cross-disciplinary: I regularly coteach with legal economist David Weisbach a course on global inequality. And it is designed to cross political lines as well: this year I’m coteaching a seminar on Public Morality and Legal Conservatism with my conservative (?) colleague Will Baude. Another distinctive feature of our philosophy curriculum is the cross-fertilization of different sorts of students: PhD students in philosophy and political theory are in the same classes as law students, which is very good for both. Today the Freund-Harper idea has come under attack. What’s in the air—in a new curriculum designed by alumni at NYU; in an op-ed in the New York Times by two leading legal educators, one the Dean at Northwestern; and, more informally, in numerous law schools I’ve recently visited—is the idea that we cannot afford the old three-year curriculum, with its invitations to elective courses and hence to interdisciplinarity. Given the general courses that a legal education must include, dropping the third year offers no time for interdisciplinary electives, but the new wisdom is that this would be no loss. Now of course the issue of cost is huge, and I do not mean to brush it aside. Means follow ends, and we must first get clear about whether, and why, our traditional goals are valuable—as the experts from NYU and Northwestern say they are not. I believe we should answer today’s attackers in just the way Freund and Harper answered their critics. Our society is not perfect, to put it mildly. Nor are its laws perfect. Lawyers should not just be instruments of the status quo, obeying its norms without reflection. (That’s basically what I think the two-year curriculum produces.) They should be independent and critical participants, who work to shape a future that is better than the past. Far more than many nations, ours has in fact realized broad social objectives through lawyering. Both the Civil Rights movement and the feminist movement offer stirring examples of how lawyers who think outside the box can do something major that benefits us all. When I work with the women’s movement in other countries, it is striking that there is not always the same confidence in lawyers and law. We’ve done something fine, and we’ve done it because of interdisciplinarity, and the inclusion, I’d say, of philosophy within that interdisciplinarity. But nothing is really “done,” it is all vulnerable efforts in progress, easily set back. So I believe we need to fight to preserve the interdisciplinary legal education that the University of Chicago basically created, and fight to keep it in a form in which the philosophical study of justice, equality, liberty, race, gender, and much more will play a central role. I’d like to shift to another interdisciplinary mode with an equally long lineage here at the University—legal history, in particular constitutional history. One of the people that William Rainey Harper brought in to solve this problem was a constitutional historian, Andrew McLaughlin. McLaughlin came from the University of Michigan’s history department in 1906. Here at Chicago, he was a professor in the history department as well as its longtime chair. McLaughlin was incredibly prolific, and his work reached a popular audience. His magnum opus was A Constitutional History of the United States (1935), which won the Pulitzer Prize. In that book, McLaughlin offered the controversial thesis that the US Constitution was an adaptation of the informal constitution of the British Empire. McLaughlin argued that the Americans had institutionalized and legalized the practices of the prerevolutionary British imperial system. In contrast to much constitutional history that takes the US Constitution as its point of origin, McLaughlin pushed backward into the colonial period to ask about the practices and theories of earlier decades. After McLaughlin, William Winslow Crosskey took constitutional history to the Law School side of the University. Crosskey is an endlessly fascinating figure. He began by teaching courses in public utilities and taxation, but he was drawn by the siren call of the constitutional history. He didn’t have advanced training as a historian, but his master work is one that is still debated, Politics and the Constitution in the History of the United States. Crosskey was a controversial figure in his lifetime. In Politics and the Constitution, Crosskey took a radical view of the Commerce Clause. He was writing in the aftermath of the New Deal, so this was a topic of important political and legal debate. Crosskey argued that Congress had broad power to regulate commerce, including commerce within the states. Crosskey conducted extensive primary source research: pamphlets, debates of ratifying conventions, letters, and correspondence. He was also an early originalist, so he engaged in a close reading of the text of the Commerce Clause. He also analyzed the meaning of words and phrases used in the text based on sources from the 18th and 19th centuries. Crosskey argued that the dominant view of the commerce power had no basis in text, original public meaning, original intent, or practice in the early period of the Republic. “Arguments for a limited commerce power were manifestly absurd, unsound, far-fetched, and fantastic,” he wrote. As one might imagine, Crosskey’s bold claims elicited strong reactions from many of the great scholars of the day. The historian Arthur Schlesinger, Jr., who was likely sympathetic to Crosskey’s project given his own political views and his association with President Roosevelt, called Politics and the Constitution in the History of the United States “perhaps the most fertile commentary on the constitution since the Federalist Papers.” That’s quite a claim. Today, many constitutional historians in law schools, especially those of us who study the 18th and 19th centuries and the history of constitutional interpretation, recognize that Crosskey had a formidable body of primary source research and that his methods were, in some cases, laudable even if, perhaps, they were driven in some cases by his views about the politics of the day. I will conclude with another figure in this group of constitutional historians at the University of Chicago. This is, of course, David Currie, familiar to many in this room as a teacher, an author, and a colleague. David Currie was a member of the faculty for 45 years, from 1962 until his death in 2007. Like Crosskey, he did not have advanced training in history, but it seems fair to say that no one would ever have dreamt of calling him the Don Quixote of Chicago. Indeed, if there’s a recording circulating on the Internet of you reading the Constitution of the United States aloud, that alone establishes you as a towering figure in constitutional history. David Currie’s two series on constitutional history—again, still widely read, widely cited, and mined for their rich detail and analysis—are The Constitution in the Supreme Court and The Constitution in Congress. He also wrote a short book, The Constitution of the United States: A Primer for the People. He, like Crosskey and McLaughlin, intended to reach a broader audience with this constitutional history, which is also worth remembering today, when constitutional discourse all too often seems reserved for the pages of law reviews. The tradition of vibrant constitutional history at Chicago dates from the university’s founding. Today, historical approaches to constitutional law abound on the faculty, among colleagues who are self-identified legal historians and also among public-law scholars more generally. We have a rich dialogue with colleagues in departments across the Midway, many whom focus on legal history in various forms. That long tradition studies history for its own sake and also employs it as an interpretive method that can shed light on modern doctrinal questions. How do I talk about law and economics and say something you don’t already know? I’m not going to speak about the history of law and economics or the enormous influence that Chicago Law and Economics had on legal academia and American law, because many of you probably know it better than I do, and I cannot add anything interesting to that. So I thought maybe I’d do the kind of Steve Jobs/Tim Cook thing: I’ll show you the new models. What’s going on today—things that you don’t know about—and how exciting they are. The problem here again was that there was just too much. I don’t have one iPhone 7 to show, I have a lot! So these are things that are representative, but by no means exhausting what’s going on. 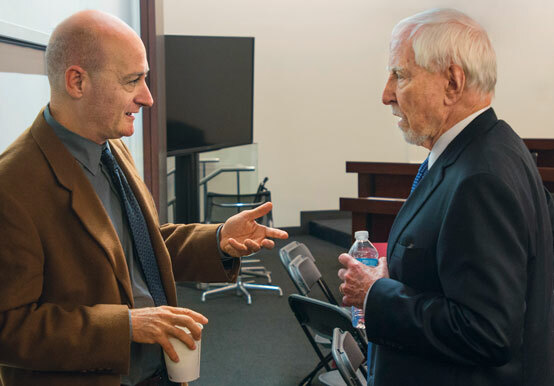 Omri Ben-Shahar (left) speaks with Jim Hormel, '58, after the panel. One thing about law and economics in Chicago is that it’s no longer just law and economics; it’s law, economics, and something else. How can we take the tools of this well-developed integration, the economic analysis of law, and apply it outside the traditional areas? One of the most exciting things is the project that my colleague Anup Malani is leading. He is doing a real-life, full-scale, large-stake experiment on how effective the delivery of health insurance is. There was a reform in India a few years ago that provided free health insurance to people below poverty level (something similar to Medicaid) but only to those people, and not to others. The question that any society wrestles with is whether universal or government-provided insurance is worth giving to everyone. There are many ways to answer it, and we have been immersed in this conversation in the US in the last decade, but one way to decide is to see whether doing it improves health and financial outcomes for people and, if so, by how much. Professor Malani is the lead researcher in a research team that measures such effects. He created a randomized study with 12,000 participants who are given the different version of the health plan available to the poor. Some participants receive the same deal, namely free insurance from the same program. Some of them receive the option to enroll in it, but they have to pay; and some receive money that would allow them to enroll, but they can decide whether to use the money for other purposes. Following the health outcomes is a long-term process—this study can continue for a generation, so, who knows, maybe Malani would one day bequeath the study to a junior scholar to take over. Think how interesting it would be to find out what happens across these groups. Nothing like this has ever been done: testing in real life in a randomized study with the right controls and the right economics and statistical methods, what are the effects of health insurance! I find it mindboggling, interesting, and important. 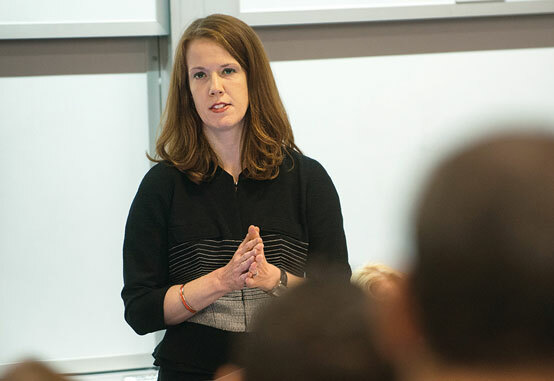 Law and economics in Chicago is also expanding outside the traditional areas and the traditional practitioners. My colleague Aziz Huq, a constitutional law scholar, has contributed to the legal debates over Guantanamo detainees, whether they are held too long, and what determines the duration of their captivity. He decided to exploit a social science method that people in his field rarely utilize: data. Where did the data come from? Fascinatingly, from WikiLeaks! WikiLeaks leaked all the files that the government has on each one of the detainees so we know how long they were held and everything else that we can know about them. Huq used statistical methods to see if we can determine what explains the duration of their detention. He did not have the full set of statistical skills necessary for such a study, but at the Coase-Sandor Institute we have a statistics lab. The Institute employs three postdocs trained in statistics who work full time to serve the needs of the faculty in running statistical tests. One of them worked with Professor Huq to analyze the data. It turns out that the longevity, for example, is not influenced by the nationality of the detainee (something that many people thought) but, encouragingly, it is influenced by measures of the riskiness to American security. These are the kind of things that before could only be conjectured or hypothesized and now can be measured. A constitutional lawyer can do sophisticated statistical regression analysis as part of the unique approach in Chicago. There is no empirical lab like this in any other law school, and the majority of our faculty have been using it. The plan is to set up an additional lab to do experimental analysis, because another trajectory of law and economics is laboratory testing. Psychologists have been doing this for a long time, so why not law professors? Many of us don’t know how to do experiments right, and for that we need an experimental psychology lab. It is my hope that we would also hire a law and psychology professor to teach at the Law School and oversee such a laboratory. A few more quick examples. One is work that is being done by a student of mine, Adi Leibovitch, so I can brag about her. She came up with a psychological conjecture that judges are affected by their caseload. For example, if a judge sees a very repugnant defendant, the judge might treat others that come afterwards more leniently because their relative conduct seems less egregious. The judge’s personal benchmark changes based on the caseload. This is a plausible idea, but can you test it? There is a kind of contrast effect that has been tested in the lab, but many people would reject the application of this to real judges. Based on dedicated and enormously helpful supervision she received from Professor William Hubbard on how to do the statistical analysis, Adi Leibovitch managed to identify a substantial contrast effect. The judges who in the early stages saw more severe cases turn out to give more lenient sentences overall, and the magnitude of the effect is large. This paper is in the process of passing rigorous peer review, which is part of the publication process of our Journal of Legal Studies. Last, I will mention a project that I am a part of myself. A few years ago I was appointed by the American Law Institute to be a Reporter on a new Restatement project. The Second Restatement of Contracts was very successful and, along with my colleague Oren Bar-Gill of Harvard, we were asked to draft a new Restatement of Consumer Contracts. Consumer contracts turned out to have many new rules that deviated from traditional contract doctrine, but their reception among judges and academics was very controversial. For example, Judge Frank Easterbrook was the author of several opinions, very influential, but also strongly resisted by scholars and by some other courts. In the past two decades there have been several efforts on the national level to try to provide a more uniform line of rules in consumer contract law. These efforts have generated reform drafts, but courts have never used them and states have never enacted them. They’ve failed, and so when I was asked by the ALI to do yet another one of these uniform law projects, I thought, well, it’s going to be fun and I’ll meet interesting people, but it’s not going to be useful. I thought, what would a law and economics person do differently? Along with Bar-Gill (and with Professor Florencia Marrota-Wurgler of NYU, who joined us) we decided to invent a new type of restatement format. Instead of providing a Restatement that articulates the leading principles based on the reporters’ expertise and their personal determination of which cases are important, we decided to do statistical analysis—to measure quantitatively which decisions and precedents have been followed more often by courts in the US. Which precedent wins this ballot of subsequent courts? Which ideas prevail? Do Judge Easterbrook’s decisions acquire a majority following, or are they largely rejected? With the aid of a regiment of research assistants, we read all American consumer contract cases and coded them into a spreadsheet. (That’s what RAs are becoming, coders of zeroes and ones.) We’re finding striking results—that particular precedents are followed by a large (and unanticipated) majority of states. When I showed Judge Easterbrook how successful his decision has been, he was surprised—since so many scholars in academia criticized it. It turns out that has a following rate of over 75 percent across states, and so the Restatement adopted his rule. Similarly, other rules in this Restatement of Consumer Contracts are supported by a statistical measure of how much they are followed, and we did not take the liberty of stating rules that follow minority positions. My sense is that there was quite a lot initial resistance at the ALI, but their leadership saw the value of such an approach, and they are now open to its use in other restatement projects. This is just a taste of different directions in which our law and economics approach is developing to give you a sense of how valuable and relevant it continues to be.